Website: . . . no Website listed . . .
. . . no Phone listed . . .
For Fun Alaska has been providing entertainment rentals to Alaska since 1991. Relax and let For Fun Alaska help your party or event be the best. Equipment includes inflatable giant water slides, Arabian nights bouncer, balloon typhoon bounce, Birthday Cake and Truck bouncers, bouncey boxing, bungee run, combo slide and bounce, giant castle, castle maze, joust, hamster ball, obstacle course and more . . . Activate this business listing. 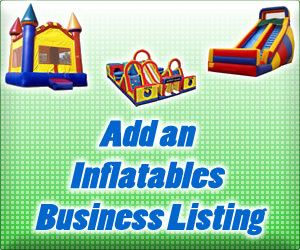 Tags: Alaska Bounce House, Alaska Bouncy Rentals, Anchorage, Anchorage AK, Barrow, Barrow AK, Bouncers in Alaska, College AK, Fairbanks AK, For Fun Alaska, Inflatable Rentals Alaska, Juneau AK, Sitka, Sitka AK, Where to rent a bouncey house in AK?